(KQED and Associated Press) The winter storm that pelted the Bay Area last night and this morning has moved on. The storm, courtesy of the atmospheric river, caused several deaths, brought high tree-toppling winds, caused power outages affecting more than 80,000 PG&E customers, and led to about 225 canceled flights at local airports. In Sonoma County, about two-dozen roads remain closed. Rainfall totals in the region over the last 72 hours include Santa Rosa, 3 inches; Petaluma, 3 inches; Mill Valley, 4 inches; San Francisco, 2.5 inches; Redwood City, 1.25 inches; Oakland, 2.5 inches. The unincorporated Sonoma County community of Venado, the perennial leader in regional rainfall, received 9.5 inches. A high surf warning remains in effect in Marin, San Francisco, San Mateo and Santa Cruz counties through Friday evening. In Oakland Wednesday night, authorities said, a homeless man was killed after being crushed by a 30-foot branch from a fallen tree. The man may have been "just trying to stay dry," California Highway Patrol Officer Herman Baza said. "Unfortunately, that protection was deadly." In Marin, a 52-year-old man was killed by a driver evading a falling tree. On Tuesday evening, the San Francisco Chronicle reports, three people in Camino, in El Dorado County, were killed on Highway 50 after their vehicle spun out and crashed during heavy rain. "It was the strongest storm to hit the region this season," said National Weather Service meteorologist Spencer Tangen, with the strongest winds and the most rain "received at once across so widespread of an area." Meanwhile, blizzard conditions blanketed the higher elevations of the Sierra Nevada with snow. An avalanche warning remained in effect for Eastern Sierra Mono County. 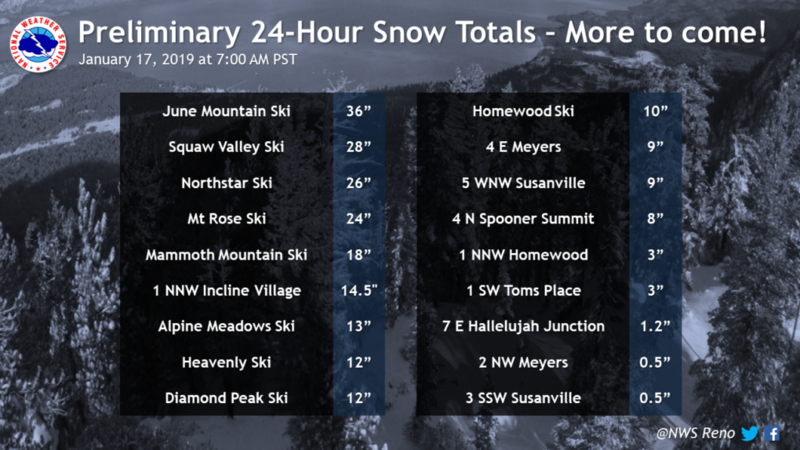 Snowfall totals from the National Weather Service Reno. Concern was also high in communities near burn scars of recent wildfires. In Santa Barbara County, the community of Montecito, devastated by a deadly debris flow a year ago, received 1.5 inches of rain in 24 hours, but has so far avoided a repeat of the disaster. A flash flood watch was in effect for the area burned by the wildfire that obliterated the town of Paradise in November. Water planners, meteorologists and weather nerds all love the atmospheric river. The weather phenomenon produces up to half of California's precipitation annually. But for the rest of us, the storms produced by the AR are a little like vegetables: We know they’re good for us, but, uh, not right now. Be that as it may, the Bay Area is getting socked Wednesday night by a powerful storm system, the first really major drenching of the winter. And with one of the biggest ski weekends of the season approaching, the National Weather Service has issued a blizzard warning for the Sierra Nevada, with "dangerous and potentially life-threatening conditions" including a high danger of avalanches. In the Bay Area, the storm is moving north to south, and it’s likely to bring torrential rains, gusty winds topping 50 mph, and a nasty afternoon commute disrupted by dangerous urban and small stream flooding, especially in the North Bay and Santa Cruz mountains, and at Alameda Creek near Niles Canyon. The National Weather Service says the Russian and Napa rivers will rise rapidly, but remain below flood levels. 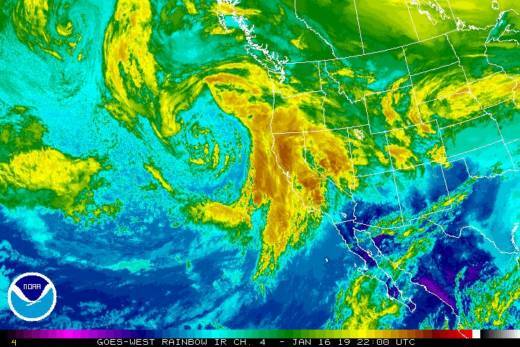 The Bay Area will likely see one to three inches of rain, which will taper off after midnight. The North Bay has already absorbed about 1.5 inches. See rainfall totals here. Meanwhile, blizzard warnings are in effect in the Sierra Nevada through Thursday afternoon, where two to five feet of snow are expected. The most extreme conditions are likely to be above 7,000 feet, which is about the elevation of Donner Summit.